NEP Switzerland supplies 4k/UHD broadcast services to MySports. Switzerland, September 2017: Marking the start of new TV station MySports, Swiss Cable provider UPC commissioned NEP Switzerland, as technology and production partner, to build and run new 4K/UHD broadcast facilities. Together with general contracting partner, Broadcast Solutions GmbH, the Swiss TV production company - part of the NEP global network - is currently integrating the latest broadcast technology in a studio plus Playout Center and an additional remote studio at two locations. With all facilities coupled by using a dedicated 100 GigE Fiber connection, the studio and Playout Center is located in Zurich whereas the remote studio is based in Rossens, in the French-speaking part of Switzerland. German System Integration company Broadcast Solutions is in charge of planning and installing all broadcast and IT infrastructure as well as production furniture. 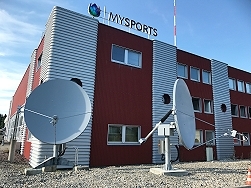 MySports successfully started producing Swiss Ice Hockey with a makeshift solution in Rossens, to be later shifted to the final location. Starting with season 2017/2018 the facilities entered service working for Pay-TV channel MySports and broadcasting the Premier Swiss Ice-Hockey league. The facilities are the first full 4K/UHD Studios and Playout Centres ever to be built in Switzerland – a landmark in the Swiss broadcast industry. 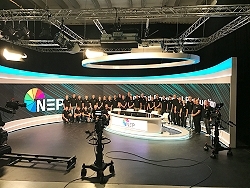 Together with two 4K/UHD OB Vans, also conceived and delivered by Broadcast Solutions, NEP Switzerland can now offer the complete 4K production, Studio and Playout chain to its customers. MySports will produce all Ice Hockey games as multi-language programs with minimum two languages. Therefore the studio in Zürich will cover the German and Italian signals whereas the remote studio in Rossens will produce the French program. Both studios are built identically with the Rossens studio being remotely controlled from the Zurich studio. The Playout Center in Zurich will work with 20 channels of live signals, thereof four channels 24/7 and two 4K/UHD channels. The facilities were used first-time by UPC channel MySports, broadcasting Swiss Ice-Hockey and Handball leagues, beginning September.